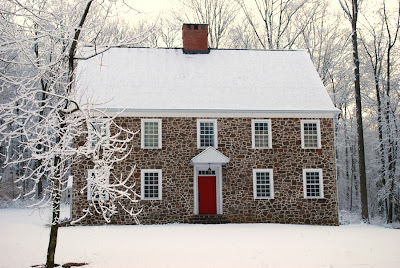 Outdoors, I took a peaceful early morning trudge to the mailbox in Pennsylvania snow. The snow, that fell silently in the night, looked magical. “Pennsylvania snow” is often the kind that melts in three days. Then another snowfall takes its place and dresses our house in white again. Indoors, I started sorting through books and sifting through old files. I found some things that might interest you for today’s topic. If we want children to learn “art” the simplest and most natural way is to place some of the best art the world has to offer into the reach of children. Art is part of life – a life of ideas. 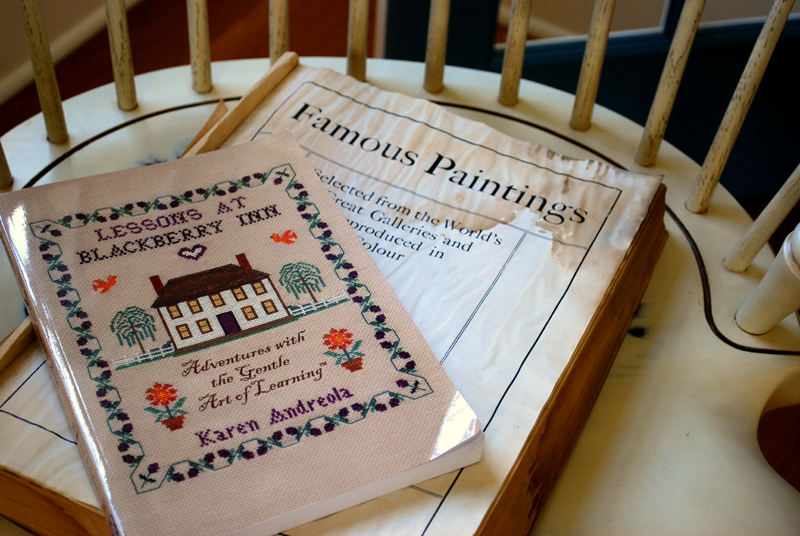 Many of us were brought up to think of art as “art class” – another one of those classroom subjects that is over and done-with upon graduation. But the world of art is something marvelous that exists outside the classroom and is not confined to it. It is this world that we introduce to children – with a healthy dose of discretion - in hopes that they will form a relation. Picture Study is one of the simplest of all subjects. 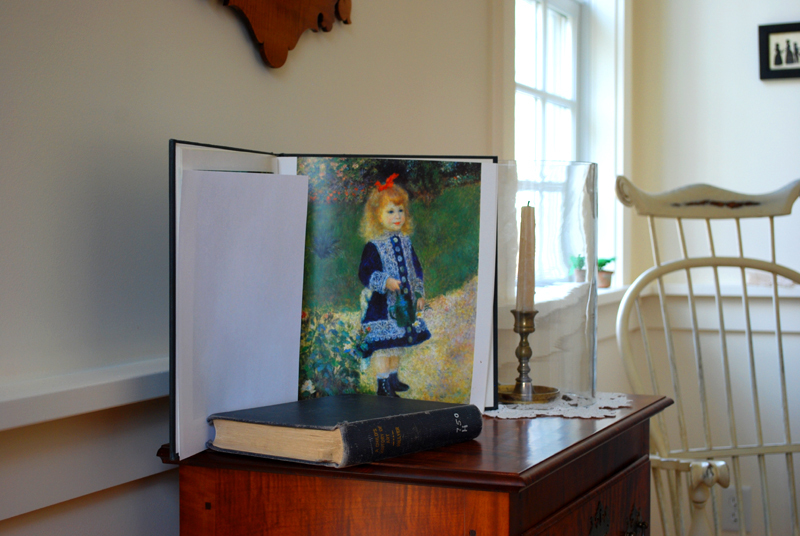 An advantageous way to become familiar with some of the world’s greatest works of art is to open the pages of an art print book. If you live in a major city and can hop on a bus to an art museum - that would be wonderful. But such an excursion is not something most of us can do regularly. Art print books are handy. They have beautiful reproductions. With the decline of bookshops and when public libraries are unsupplied, this resource could be less available than it once was. I’ve seen art print books abandoned in used bookshops and this, perhaps, may be the best place to find them. You’ll be surprised at how inexpensive they are compared to their original price upon publication. 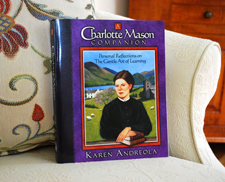 The Picture Study chapter in A Charlotte Mason Companion is a sort of teacher’s guide to get you started or to renew your interest. 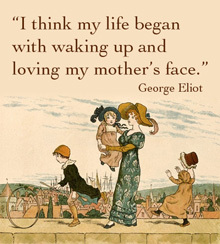 In it I quote from Miss Charlotte Mason. 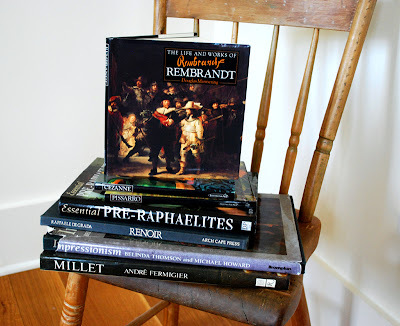 Prop up a book on a sideboard. Open to a work of art. 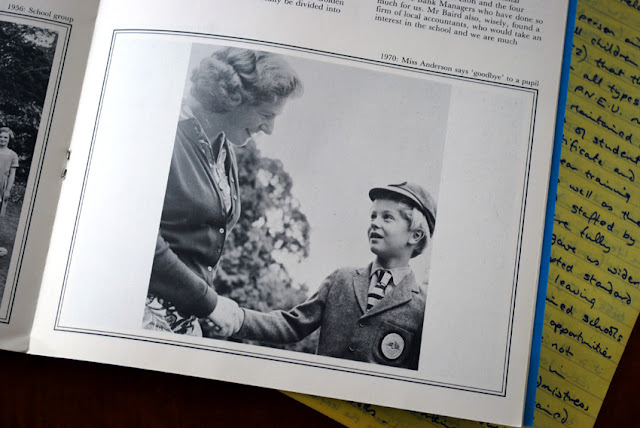 (Conceal the opposite page if it also has a picture). Display the picture for a week or more. Let the children look and look. After a few days ask a child to describe what he sees. It’s this simple. 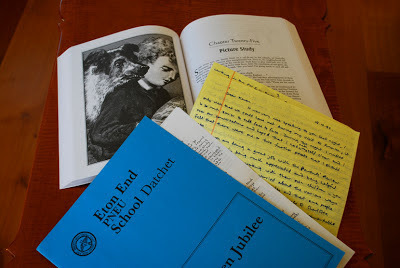 In the early 1990s I had the pleasure of written correspondence with Miss Eve Anderson, retired headmistress of the Eton End PNEU School in Oxford, England. With her fountain pen she was kind to answer my questions. I couldn’t travel when I was first invited to meet her but enjoyed our telephone conversation. Then, a few years later, I was blessed to spend a weekend with Eve Anderson. I treasure my remembrance of her. She has since gone to be with the Lord. From age 5-8 years I attended a PNEU school of probably about 30 children. It was a very happy time of learning, no stress, no pressure. I obviously learnt to read and write but what I most remember is the joy of the nature walks and coming back and painting in our nature note books. Also I remember vividly the picture study lessons, looking carefully at one picture and learning about the different artists each term. Parental support and interest is so vital. My mother used to take me to the National Gallery so that we could look at the original pictures that we had studied. She [built] in me a careful observation of nature at weekends and [encouraged me] to take interesting [nature specimens] to school. These two subjects have been lifelong interests. 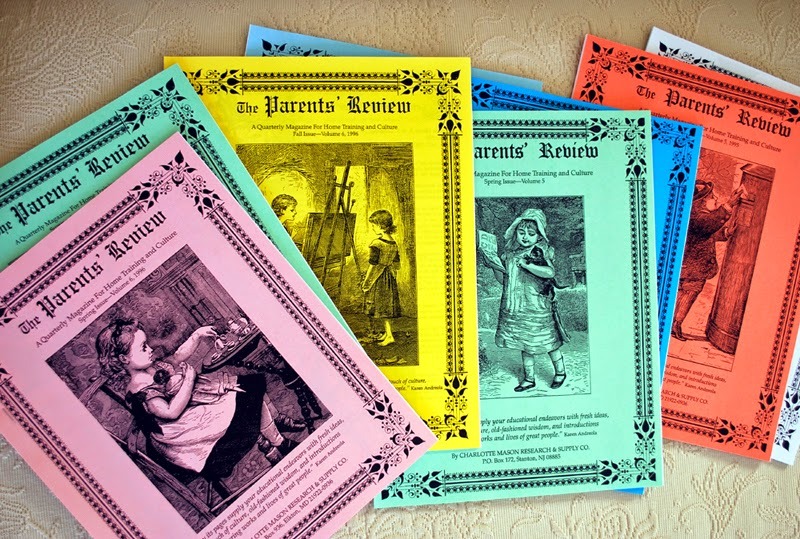 I found Charlotte Mason’s approach to art to be appealing when my children were still young. Yet, in the midst of our many household moves Picture Study would slip out of the schedule. I did learn that once you set your mind to do it (at lunchtime for example- with all the children together) it could be restarted without much ado. 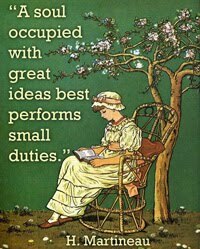 It requires foresight but very little time and effort to perform. 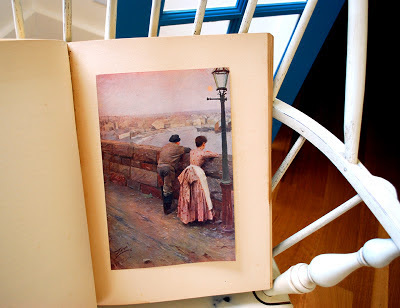 Although no fancy curriculum is needed, Picture Study is something Miss Mason recommends we do not leave to chance. Her plan is to “take one artist after another, term by term, and study quietly some half dozen reproductions of his work in the course of a term.” *2 This helps us become familiar with the style and characteristics of one artist’s works. “Oh look Mommy, it’s a Renoir,” a child may speak out when you enter the dentist’s waiting room and a reproduction of “Girl with a Watering Can” is in plain view. My son and I got to see Renoir’s “Girl with a Watering Can” in person when we visited Washington D.C.’s National Gallery of Art in 2007 (his graduating year.) It was one he decided to photograph probably because of his familiarity with it during in our early years of appreciation. He also photographed the one painting by Leonardo Da Vinci there at the time. I liked the room of Dutch painters. That day was icing on our cake. What a sad state my copy of Famous Paintings is in. It is the book I used to help me write the art appreciation portions of Lessons of Blackberry Inn. Although the cover of Famous Paintings –Selected from the World’s Great Galleries and Reproduced in Colour – With an Introduction by G. K. Chesterton and Descriptive Notes - was irreparable, and did not survive a pipe leak in the basement, the body of the book, though dampened, is recovered. 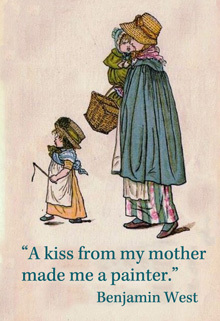 Wishing to begin Picture Study with her children but finding herself without any sort of curriculum that includes six of an artist’s works, my character, Carol, “makes do” – but quite happily so with FamousPaintings (which was in publication during the 1930s when the story takes place.) Although she doesn’t follow Miss Mason’s specific plan Carol follows the spirit of the law. 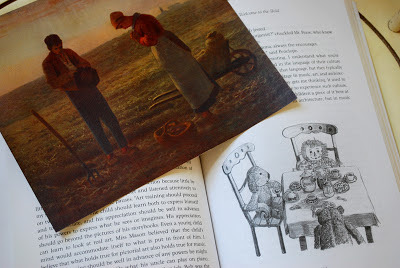 A painting by Jean Francois Millet would be first to catch the eyes of the children. My thoughts precisely. Imagine that. 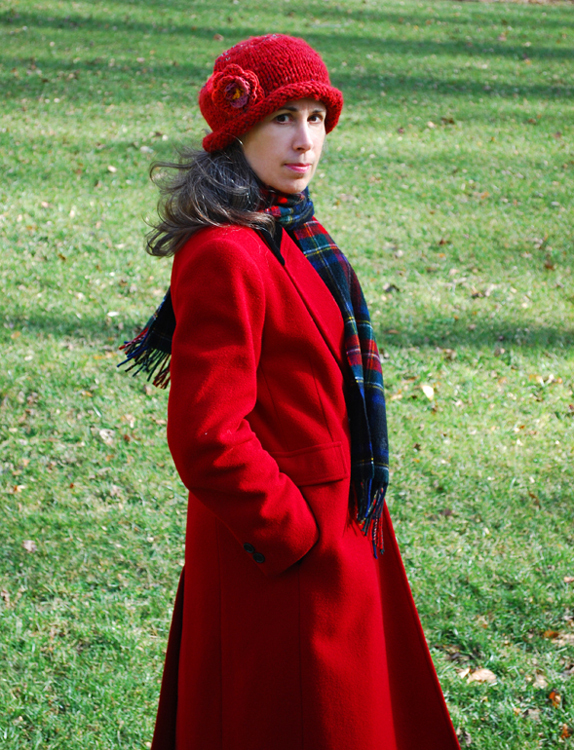 Red in winter lends a kind of warmth and brightness to cold gray days. 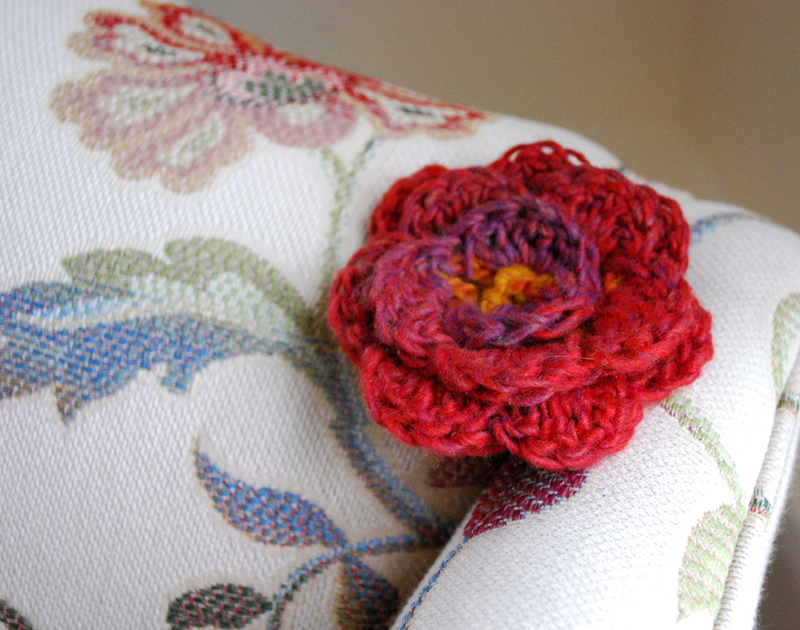 A crocheted rose came in the mail for the Lady-of-the-House. 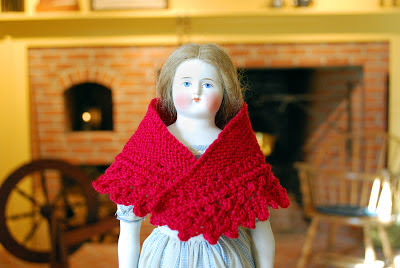 She is as pleased as punch with its shades of red. A welcome feminine accent, it is pinned it to the hat she knit for herself. 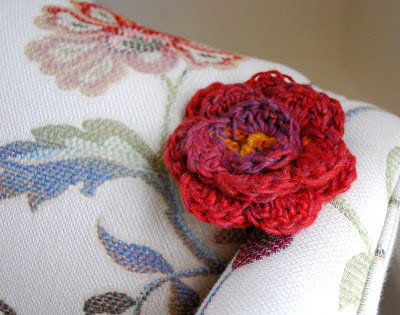 Lisa of Happy in Dole Valley crochets posies in pretty colors for her etsy. This 18th century American, of relentless curiosity and ingenuity, would probably approve of the twist to his motto. The priority is the same. How long will it be before the Lady-of-the-House gets used to her kindle and appreciates it for its convenience, economy and ability to pack whole bookcases into its memory? A printed page may always seem the normal thing to her but she is open to trying new things. 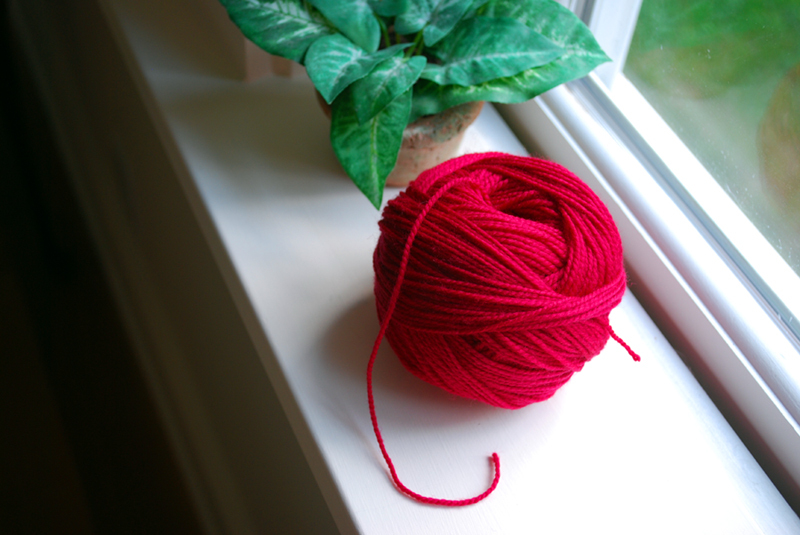 Do you know how to wind a ball of yarn so that it can be drawn up from the middle? Make a tail. Place this tail between thumb and forefinger. 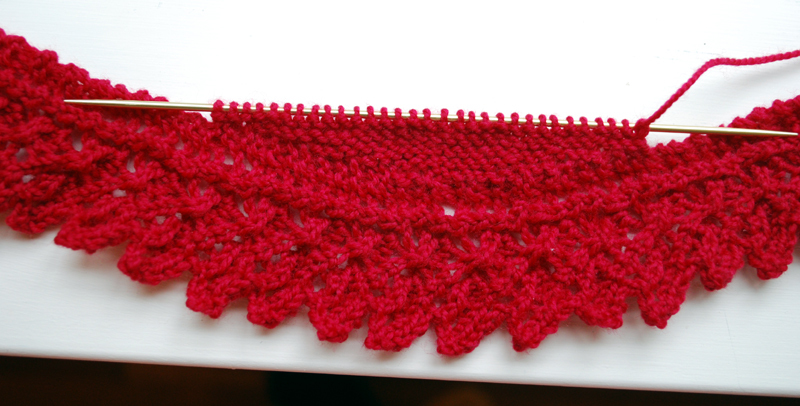 Wind the yarn around it loosely. Continue to wind loosely in varying directions with three fingers now, keeping watch that the tail is always accessible. Wool responds better to being knit up when it is allowed to keep its natural elastic kink and hasn’t been held taunt in a tight ball. 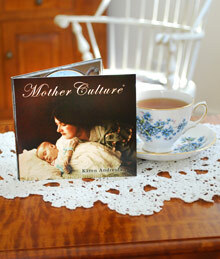 A mother, too, responds better to her husband, her children, the day’s duties, when she is not uptight – can pace herself and reserve some minutes to unwind. Fine red yarn on narrow needles makes a bright lace edging. 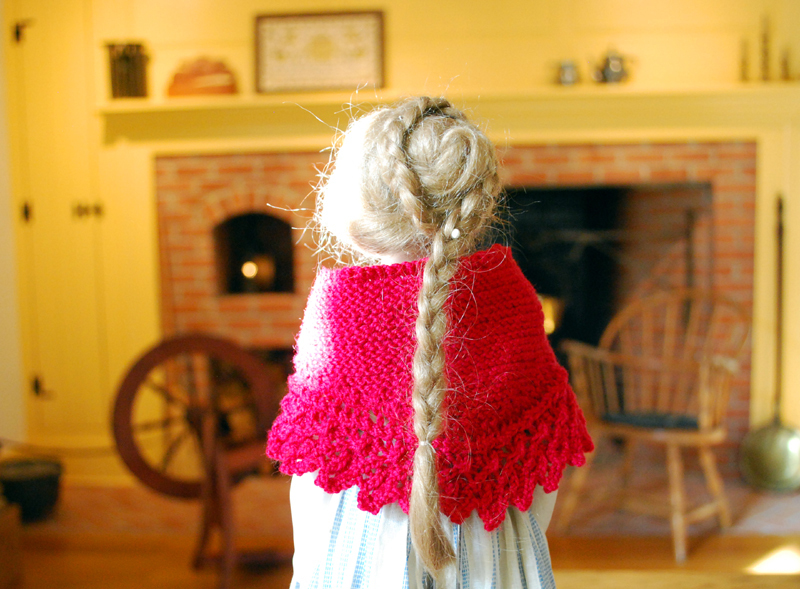 After the strand of lace reached the desired length to edge a shawl for Helen, the Lady-of-the-House attached yarn to the center of the strand. 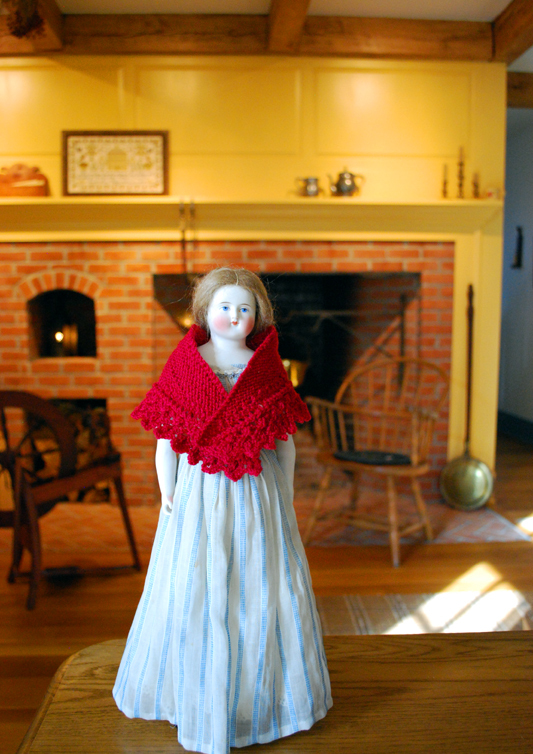 To begin the body of the shawl, pick up three stitches at the center and knit across. 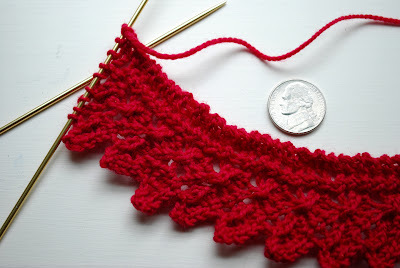 Pick up two stitches at the end of each row - knitting one at a time as you pick them up. Turn. Knit the next row picking up and knitting two, etc. Repeat, and watch the garter stitch shawl form into a half-moon. 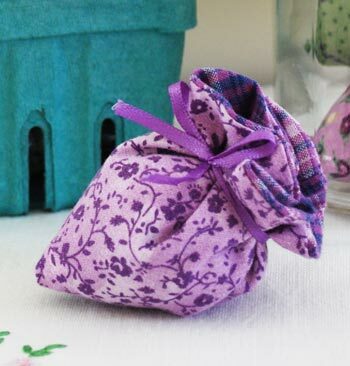 At home, with the skirt out of the bag the Lady-of-the-House feasted her eyes on its colors and ran a hand over the warm-as-a-blanket fabric. “Do you like it?” asked the Man-of-the-House. “Yes, I do,” she replied. He was instantly proud of his purchase - and again when she thanked him in her usual manner. She likes the skirt’s 1940’s style. But she has one quibble. She is still getting used to the so-called “natural waistlines” of this century. Whatever it’s called – it means “off the waist” to her. 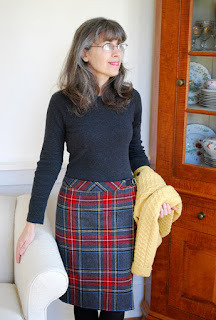 Anyway, she is happy at how her butter-colored cardigan picks up the gold thread of the skirt, warm and bright. 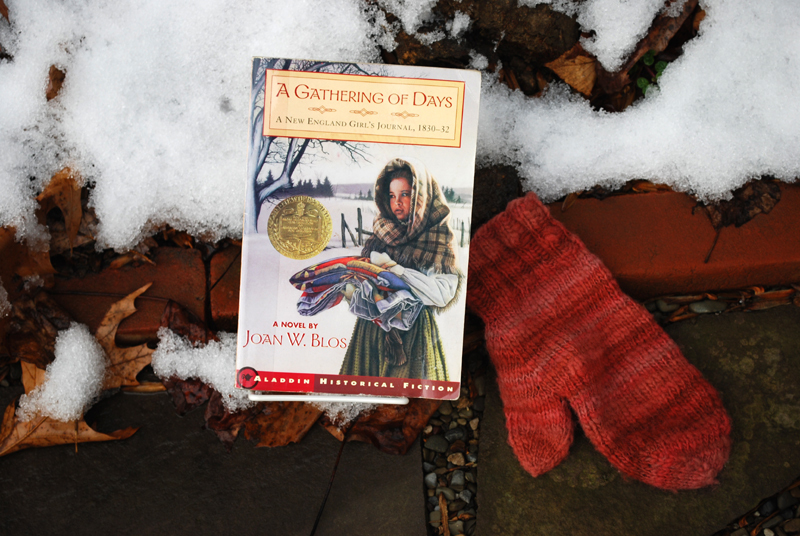 A story that could turn into a perennial read for those with early American leanings is A Gathering of Days by Joan W. Blos, awarded a Newberry Medal. 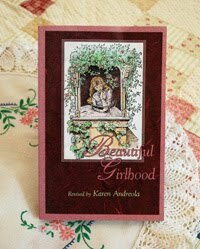 It is a little novel, meant for girls ages 8 -12 - so it states on the back cover - but it proves a warm and bright companion to the Lady-of-the-House - a grown-up who can get uptight with life’s trials and cares. Trials and cares are common to most of us and it helps to be transported to another time and place - to unwind – to be put in company with the intimate lives of the people of a story. It is a relaxing comfort to the Lady-of-House to read this fictional dairy of Catherine age 13. Catherine begins her diary on October 17, 1830 in the state of New Hampshire where, like most of her neighbors, her father is a farmer. This is a gentle, quiet story where Catherine records the struggles and joys of pioneer living, her father’s remarriage, and the loss of her closest friend. 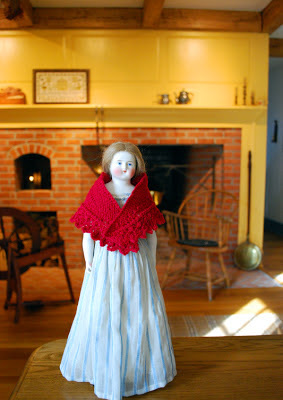 She takes part in the traditions of a rural community. Although there is no mention of Christ Jesus, the family observes the Sabbath, respects and looks up to Providence. There is historical flavor to the writing, such as the subtleties of Catherine’s speech. Because the author did extensive research, pouring over archived newspaper articles of the 1830s, Catherine’s choice of words seem natural and so convincing that, along with its other early American atmospheric details, the diary seems more real than fiction. 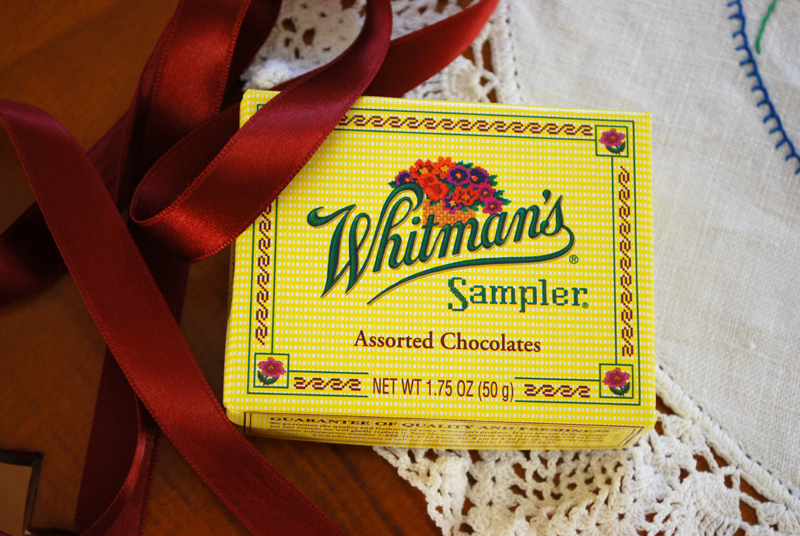 Have you ever noticed how the design on a Whitman’s Sampler resembles a traditional cross-stitch sampler? 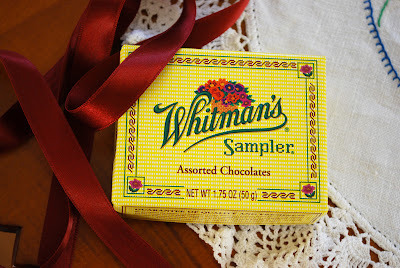 A deep red satin ribbon was wrapped around a box of four luscious chocolates - a February surprise for the Man-of-the-House. He shared his surprise with the Lady-of-the-House. And thanked her in his usual manner. 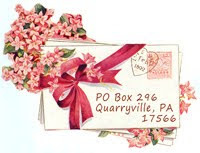 I wish you a February in many ways warm and bright. I like Christian lyrics by Petra in "The Coloring Song."